Bear with me, I know the word does not trip off everyone’s tongue easily and my explanation below is a sort of an essay. But believe me when I say, that once you’ve eaten this dish you’ll be looking for excuses to make it. Bhujne (pronounced with a ‘z’ sound) is a very versatile…curry, for lack of a better word. It provides a base for fish (primarily), prawns, eggs and potatoes, in that order, in any good PP kitchen. The potato version, while every bit as good as the others, is a compromise for the days when the PP kitchen is forced into a vegetarian avatar. The tongue still craves the familiar and desirable and the Bhujne leaps into action to save the day. Anyway, it’s this vegetarian underdog that’s represented on my blog today. Do give the fish or boiled egg version a try too (details in the notes). Comparisons, thoughts and comments welcome, as always. So, on to more practical aspects. This version serves 2 as a side. In a large bowl, mix the ingredients listed for the gravy. Once all the ingredients have turned into a more or less homogenous paste, your gravy paste is ready. Pour this into a wide sauté pan. Turn on the gas to medium heat. 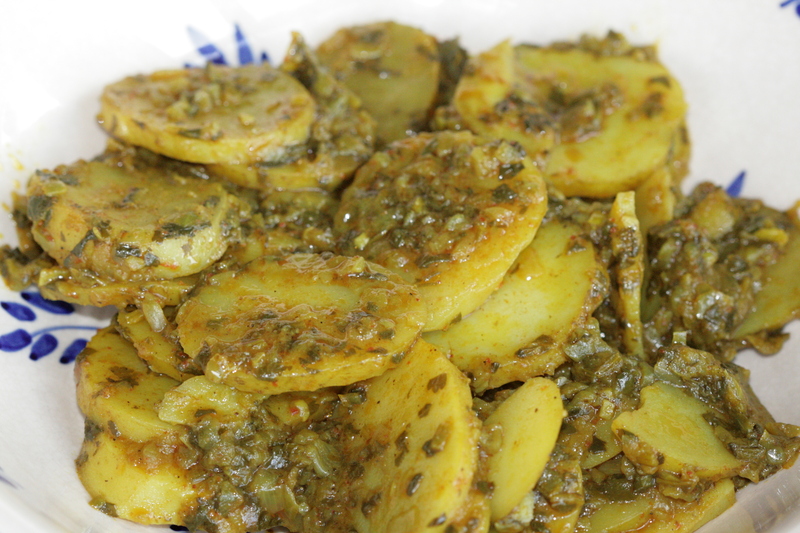 Place the sliced potatoes in the gravy and cook for 15-20 minutes till potatoes are well cooked. Serve hot with varan bhaat or with hot phulkas. 1. Boiled egg bhujne: 3-4 hard boiled eggs cut in half and cooked in the gravy for 10 minutes or until the onions in the gravy are well cooked. 2. Fish bhujne: I marinade the fish in the gravy mixture for about 30 minutes and then proceed to cook it as detailed above and until the fish is well cooked. 3. Sambhar masala: This is a traditional PP masala. (It is completely different from and has no connection with the sambhar masala used in South India.) It is a mix of spices and is used in most PP dishes. One day, I intend to make my own when I’ve worked out how to make it in small batches. This entry was posted in Batate (Many ways to cook potatoes), Gravy dishes and tagged Bhujne, chillies, ginger-garlic, Pathare Prabhu bhujne, potatoes, sambhar masala, vegetarian. Bookmark the permalink.